THANK-YOU TO ALL WHO ATTENDED THE 2016 HERITABLE AORTIC DISEASE CONFERENCE IN TORONTO!!! THANK-YOU TO ALL WHO ATTENDED THE CONFERENCE IN TORONTO!!! 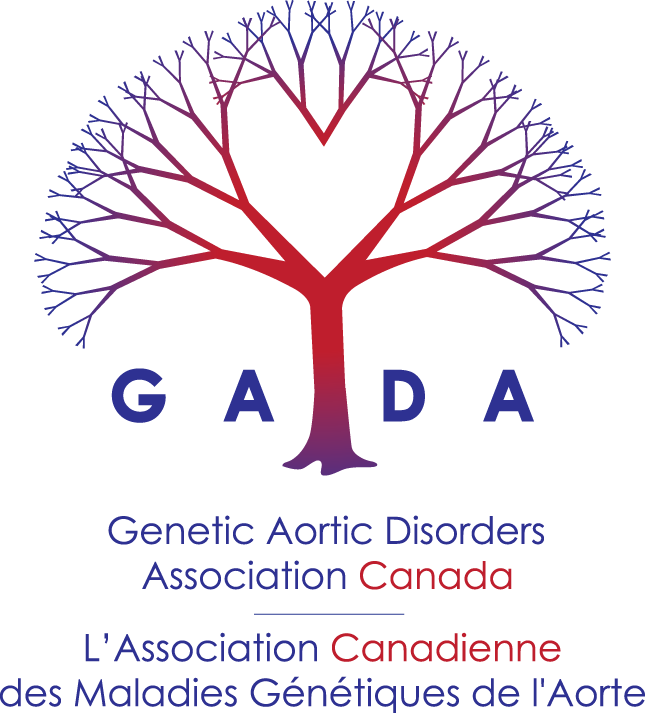 GADA hosted its 18th national conference in Toronto, Canada. The conference was co-hosted by the Peter Munk Cardiac Centre (PMCC), University Health Network (UHN) and the University of Toronto. The two day conference event was held at the BMO Conference Centre, Toronto Western Hospital, on September 16 and 17, 2016. Co-chairs for the conference were, Dr. Maral Ouzounian, Cardiac and Aortic Surgeon at the PMCC, Toronto and Dr. Nanette Alvarez, Adult Cardiologist and Director of the Adult Congenital Heart Disease Clinic at the University of Calgary. The first day of the conference featured teachings and presentations by leading North American specialists and researchers, to update medical professionals about the latest research, diagnostic protocols, and the health management of patients diagnosed with genetic aortic disorders (GAD). The keynote speaker was Dr. Reed Pyeritz, William Smilow Professor of Medicine and Professor of Genetics at the Perelman School of Medicine, University of Pennsylvania, USA. Dr. Pyeritz has long been recognized as an international authority on the genetics of cardiovascular disorders, especially Marfan syndrome and hereditary hemorrhagic telangiectasia (HHT). He is GADA’s Professional Advisory Board member and Chair of the Montalcino Aortic Consortium. Dr. Pyeritz opened the conference with key information learnt from patients over the last three decades that has resulted in the identification of an increasing number of disorders related to Marfan syndrome. Dr. Dianna Milewicz, University of Texas Medical School at Houston, USA, explained the different gene mutations causing aortic disorders with varying degree of manifestations. Dr. Milewicz is the Chair of GADA’s Professional Advisory Board and the Scientific Chair of the Montalcino Aortic Consortium. Her research team has identified many of the genes for inherited thoracic aortic disease and more recently, she has investigated the genetic causes of childhood strokes. Dr. Milewicz expressed the importance of family history and genetic testing of individuals presenting any of the symptoms of aortic disorders. Cardiovascular surgeons from Toronto and other Canadian Provinces provided evidential information of surgical thresholds for proximal aortic disease, surgical management of aortic root, endovascular repair and management of acute Type B dissections. Dr. Kate Hanneman, Radiologist at the Joint Department of Medical Imaging, Toronto, demonstrated modalities and measurements to consider when imaging the thoracic aorta. For more details on the speakers please check the GADA conference program book. Dr. Tim Bradley, Pediatric Cardiologist, Royal University Hospital, Saskatoon, SK, gave an overview of medical management and lifestyle counselling for heritable TAAD. Dr. Gabrielle Horne, Cardiologist, Maritimes Connective Tissue Clinic, Halifax, described an update of multidisciplinary care and improving the quality of life for TAAD patients. Mitra Esfandiarei, PhD, Midwestern University in Arizona, USA, presented data from her research that focusses on understanding the underlying mechanisms contributing to the progression of aortic aneurysm in Marfan syndrome and the protective effects that exercise may have on the disease process in both laboratory animal models and human patients. The second day was a half-day program dedicated to informing and addressing concerns of patients and families. Dr. John Janevski, Adult Cardiologist, TGH, Toronto, presented an overview of the diagnosis and medical treatments currently being used for heritable TAAD. Dr. Dianna Milewicz stressed on the importance of genetic testing for the entire family of individuals carrying aortic disease mutations. Dr. Ismail El-Hamamsy, Cardiac Surgeon, Montreal Heart Institute, demonstrated the importance of knowing the signs of aortic dissection and keeping-on-hand information of aortic specialists, especially forr emergency aortic surgical procedures. Dr. Irene Maumenee, director of the Ocular Genetics Laboratory and Research Director of Ophthalmic Genetics at the University of Illinois Eye and Ear Infirmary at Chicago, USA, presented and facilitated the Ophthalmic management and treatment workshop. The feedback from the attendees was that the talks, panel discussions and patient workshops were very informative and excellent with interesting updates on hereditary aortopathies. Members have indicated their keen interest to attend such an event in the future. We are extremely grateful to the members who attended and to the specialists for making themselves available to make this conference a successful, beneficial and memorable event! We are especially thankful to the volunteers for their time to help with the conference preparations and set-up. GADA sincerely thanks Dr. Maral Ouzounian for assisting us with promoting and organizing the conference on behalf of the PMCC, UHN and University of Toronto. We humbly thank the sponsors and all those who donated, without the support it would be impossible for GADA Canada to host such an event. We continue to look forward to your support as we grow to serve our Canadian community.